These groups are then divided into numerous bands, each of which takes its name from a particular geographic locale. In this way, Apache identity is closely woven with place. The Apache concept of Ni – or integration of the mind with the life force of the land – speaks to this deep connection. Thus, the Aravaipa are known in Apache as the Dark Rocks People (after the black rocks of the Galiuro Mountains and Aravaipa Canyon). The closely related Pinal are known as the Cottonwoods Gray in the Rocks People (after the trees at the mouth of the San Pedro River). All told, there are around 22 distinct Apache bands, all of whom are identified with a specific ancestoral landscape. Because the Apache did not create permanent monuments or dramatically alter the landscape, few physical traces remain of their pre-colonial past. Outside of origin myths and family narratives, what is known is that spoken Apache is related to other Athabaskan languages, like those of the Navajo and, further north, the Tlingit of British Columbia and Alaska. It is for this reason scholars surmise that the Apache migrated to Arizona from the north, perhaps some time around the 15th century when the extensive Hohokam civilization all but disappeared. By the early 1700s if not sooner, they had established settlements in the protective holds of southeastern Arizonas mountain slopes, foothills and canyons. The Spanish called their territory, which stretched from the Mogollon Rim to the Natanes Plateau to the Gila River and the northern Catalinas, Apachería. Apache members trace their lineage through the mothers line. In pre-reservation times family groupings (gotah) were led by a headman (and occasional headwoman), who organized the work and decided on seasonal migration. Bands were made up of several gotah. Chiefs were chosen by the gotah headmen, on the basis of their wisdom, wealth and generosity, skill, honesty and even temper. The chief was responsible for mediating disputes and coordinating activities. In addition, the Apache maintained close matrilineal clan ties, which extended across bands and groups and helped to create networks of mutual support, as well as govern marriage and the use of farming sites. Beyond the band was the major group. Allegiance was not by force but by choice. Large groups might come together to undertake major ceremonies or large-scale hunting parties. 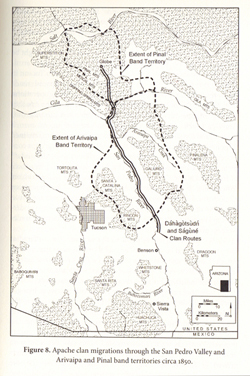 Most of the time, gotah, bands and groups exercised a high degree of autonomy. In the often harsh and variable desert climate, this flexible social structure allowed families to adapt to changing circumstances, as needed. In Apache communities, industriousness, generosity, honesty and bravery were valued as qualities essential to the groups unity and survival. Until their forced relocation to reservations, Apache lived by a combination of seasonal farming, gathering and hunting. 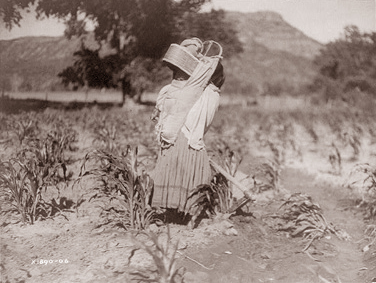 Because of access to year-round running water, agriculture played a large role in Aravaipa and Pinal Apache life, with farms producing corn, squash and legumes in abundance. Given the deserts unpredictability, however, survival equally depended on collecting many different kinds of food, including mescal, acorns, berries, leafy greens, medicinal herbs and wild game. These were often found at great distances from the main farming settlements – and for only short periods during the year. Fall was reserved for the harvest and the preparation of foods for storage, in time for winter. Unnamed Apache woman hoes corn using the same methods as those followed by the Aravaipa Apache. Photo by Edward Curtis, Dec. 1906. 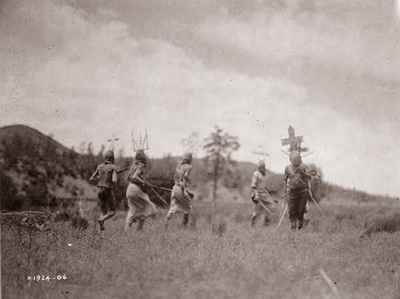 Apache men dancing. Photo taken by Edward Curtis ca. 1906. Courtesy of the Library of Congress. Ramon Riley, White Mountain Apache elder. Quoted in Massacre at Camp Grant by Chip Chanthaphonh. The people settled in these different places, where canes were growing and there were cliff dwellings. Then all came down together. Now at the last place they became t´íst´é´d´nn´áid´n [Cottonwoods Extending to the Water People]. Before that they had no name. From 1930s oral history collected by Grenville Goodwin. Quoted in Shadows at Dawn by Karl Jacoby, p.147. We have a story, about long ago, how the Tséjíné [Aravaipa Band, Dark Rocks People] and T´iis Tseb´n [Pinal Band, Cottonwoods Gray in the Rocks People] came to move to their own countries ... This must have happened very long ago, when the Earth was new and still soft. Walter Hooke, Aravaipa Apache. Quoted in Ian Records Big Sycamore Stands Alone, p.51.